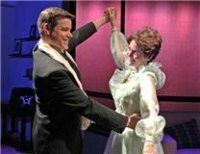 HUNTINGTON, WV (HNN) – A Huntington woman who earned her theatre degree at Marshall University has been nominated in Syracuse , New York , for her performance in “Six Dance Lessons” at the Cortland Repertory Theatre. The nominations and awards recognize outstanding achievements both community and summer theatre groups in Central New York. Mary Poindexter Williams earned stellar reviews for her performance in “Six Dance Lessons in Six Weeks” in August 2010 at the Cortland. Having previously termed her opportunity in the production as a “unique experience of challenge and reward,” Ms. Williams recently received a “best actress” nomination for the role of an aging retiree in the production. Reviewers called her comic delivery “flawless,” her timing impeccable, and bringing “considerable poise” to the role. The SALT awards will be given out in May 2011.